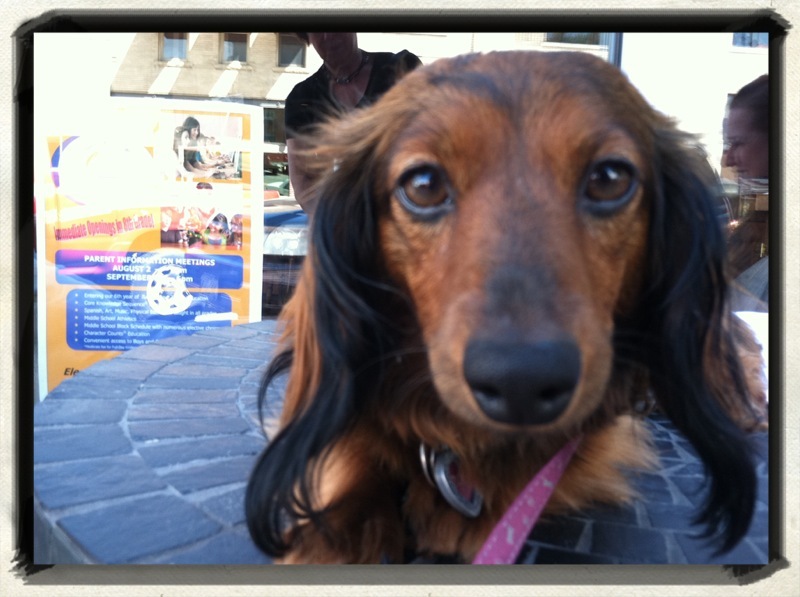 Zoey the Cute Dachshund needs and wants attention. In addition to play, dogs need attention, but this attention should not spoil us – though as the cutest dachshund on the planet, I deserve a bit of spoiling, as well as the princess treatment. Of course, dog training books recommend princess and not-so-princess-y dogs get a healthy dose of attention that includes daily walks, exercise and play time. Like humans, we need love and attention, as well as stimulation to keep our minds active and to be socialized. If we don’t receive this attention, we can be harder to train, disobedient and destructive. When left alone, we may chew on shoes and furniture, get into trash and mark beds and floors (puppies chew as part of the teething process, but adult dogs should have learned acceptable behaviors and identified the difference between the chewable and not so chewable options). Seeking immediate attention, we may resort to jumping up, barking, whining, pawing and dropping a toy or ball into the lap. These behaviors are cute in a puppy, but adult dogs need to know about positive ways of seeking attention, such as sitting nicely or playing with our toys on our own. Dogs need to have some independence, so don’t reward us if we’re continuously demanding your notice. Help us develop our own interests, such as giving us something new to chew while you work on your laptop, writing blogs. Don’t reward us for poor behavior, such as barking or pawing at you, because the attention only temporarily stops our undesirable behavior. We’ve learned we can get a response out of you, and we’ll do it again. As soon as we resume our good behavior, reward us for that, like now when I stopped pawing at the patio door and got to go back outside. 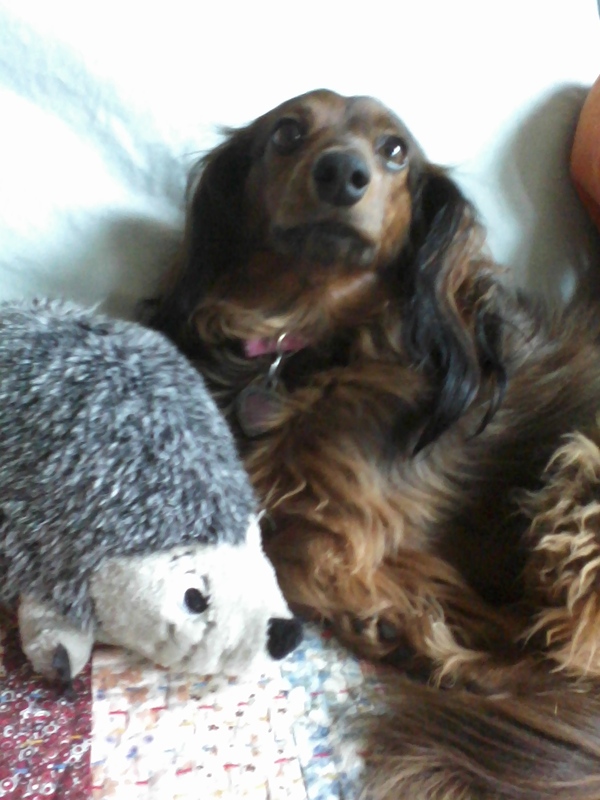 Even stubborn dogs like dachshunds will eventually catch on. And as a note, we shouldn’t be left no more than eight hours a day. Then we’ll really have a reason to complain. Zoey is ready for some play time as she hangs out with her toys. 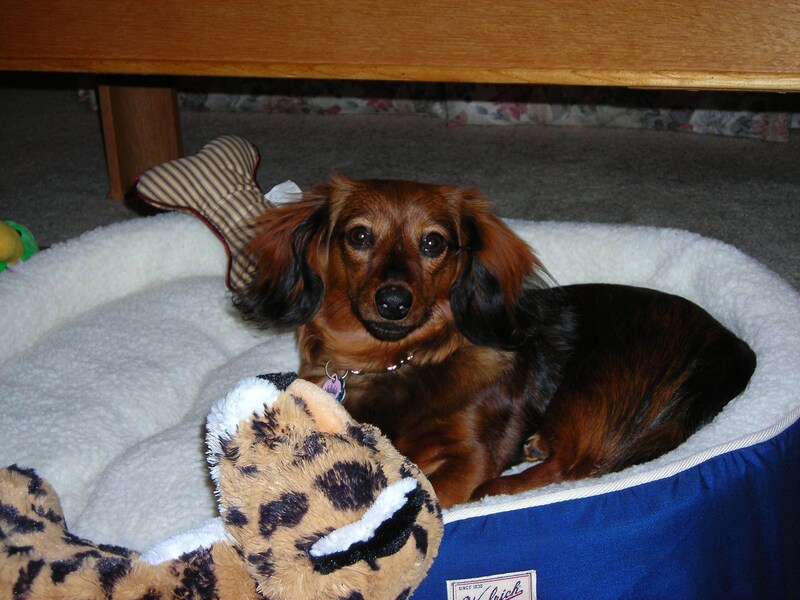 As a very cute miniature dachshund, I need to explain a little about the importance of playtime. Dogs need to play to learn, exercise, maintain health and experience the world around them. Genetically predisposed to be flexible and adaptable, they like novelty in their play. New toys and variety in games help stimulate their brains and keep them mentally active. Unlike humans, dogs don’t need to force themselves to exercise, which for us is play. We naturally run, which is one of our favorite things to do and we don’t need any motivation to do so. We run from scent to scent if you let us off leash in a dog park or backyard, or even on our walks. In the wild, we have to be good runners to chase our prey or to avoid being such. Running hasn’t been bred out of us through domestication, so that’s why a daily walk isn’t enough. Exercise and play allow us to expend our pent-up energy, while also relieving stress and providing a mental break, just as it does for humans. It helps keep us healthy, agile and limber and makes us sleepy by bedtime, instead of restless. I’ve read that dogs that don’t get regular exercise will chew, dig and act destructively to seek attention (not that I’ve ever done that, not at all). Some good games to get us to run include playing fetch, find it, hide-and-seek, and keep away, a game where we dodge away from you as we hold a toy (or sock, which I like) in our mouths. Mental exercises also burn off energy, such as food puzzle toys, agility courses, obedience and trick training, and chew toys. I’ve read that we need 20 to 30 minutes of running every day as a minimum. Note that I need all hours that I am awake to be told that I’m cute. Thank you. Zoey is ready for some playtime and some attention! I am totally exhausted from my week-plus of fun with Shelley, my BFF. My BFF had eight days off, which meant I had eight days on and didn’t have to sit around and wait for her to come home from work. I had her attention 95 percent of the time, minus the 5 percent she had to cook, clean, go to the gym and hang out with friends, all without me. I require 24-7 attention, minus the hours I’m sleeping or hiding under the bed for an extended pout session. I pout when I’m not getting the regard I need to be a happy puppy. • I bark really, really loud from my perch on the patio to let passersby and anyone heading to or from their cars know that here I am. Notice me, and notice me now! My tail wiggles with the joy of seeing those who might possibly notice cute, darling me. • I stand on my hind legs, rapidly crossing and uncrossing my front paws in an excited “give me-give me” dance, staring with my large brown eyes. See me, see me be cute!